Even as a deal is imminent between Uber and its closest competitor Didi Chuxing in the immense Chinese market, competition in ride-sharing continues to intensify around the globe. The product comes via a partnership with Craft Silicon, a Nairobi based software company. Little Cab runs on iOS, Android, and Windows devices and will soon be available for USSD (non-smartphone) users. The new app accepts cash, card, and Safaricom’s M-Pesa mobile money for payment. It provides live GPS enabled maps for pickups and offers free Safaricom Wi-Fi to passengers. 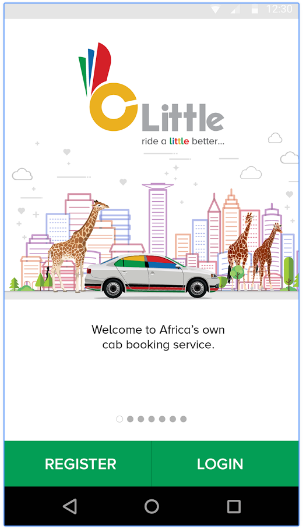 In addition to its unique features, Little Cab could become a homegrown competitor in Kenya’s burgeoning ride-booking market. Uber launched in country in 2015. Other outside transit apps include Dubai owned MondoRide and recent Estonian entrant, Taxify. Locally there’s Dandia and Maramoja, a social media based transit startup. The market has already seen some attrition, with Jumia Group (formerly AIG) backed Easy Taxi Kenya shutting down this spring. What significantly differentiates Little Cab as a ride-hail app is its connection to Safaricom, which has one of Kenya’s most powerful brands and extensive product networks. Little Cab’s media release indicates the Safaricom/Craft Silicon venture has come out swinging against Uber and other competitors. On price it touts itself as “the most affordable option in the market” at 55 Kenyan Schillings (KES) per kilometer (about .50 cents) compared to Uber’s KES 60. Safaricom also zeros in on driver wages, a sensitive aspect of Kenya’s online taxi market. “Little Cab will take no more than 15 percent off driver’s earnings, compared to other players in the market; Uber’s 25 percent…,” states the release. While Uber has been relatively well received in Kenya, its entry has brought some protests and even violence connected to disruption of local taxi operators. On goals, “Little Cab aims to achieve one million rides in the next six months by entrenching and differentiating ourselves as a homegrown taxi app,” said Craft Silicon CEO Kamal Budhabhatti. Led by Little Cab and Uber, the race for market share in Kenya’s ride-hailing space is set. While formal data on the country’s online transit market is sparse, broader factors offer a compelling backdrop. Kenya is Sub-Saharan Africa’s eighth largest economy ($63bn GDP), sixth most populous country (46 million), and one of the continent’s more tech savvy nations—dubbed Silicon Savannah for its IT achievements. In the innovation space, Kenya is perhaps best known for the success of Safaricom’s M-Pesa fintech app. Launched in 2007, the mobile phone based payments product is used by 20 million customers, has a network of 85,000 agents, and generated $309 million of Safaricom’s $1.5 billion 2015 revenues. As ride-hail apps compete for Kenyan clients, much will come down to what each can offer around cost and features. On price, Little Cab may have already sparked a war. This week Uber will announce a 35 percent fare cut on its UberX cars, confirmed Uber Africa spokesperson Samantha Allenberg. The new plan will lower cost per minute charges, minimum fare charges, and cost per kilometer charges from KES 60 to KES 35. In addition to price, players in Kenya’s ride-booking market (namely Little Cab and Uber) are facing pressure to extend more product options. “Both of them will have to look at what they are offering with bundled services in their vehicles,” said Bitange Ndemo, a professor of entrepreneurship at the University of Nairobi and former national minister of technology and information. “Already for Little Cab, offering Safaricom’s free Wi-Fi will be a pull. It gives people the option to pick up their laptop and do work in our traffic jams,” said Ndemo. “I would not be surprised if Uber ends up deploying Wi-Fi on their vehicles in Kenya too.” Dr. Ndemo also pointed to Little Cab’s advantage in allowing Kenya’s non smartphone users—more than 50 percent of the country’s mobile market—to hail taxis via SMS. Whatever product options find traction with Little Cab (and other apps), expect Uber to counter, and vice versa. Uber has given its Africa managers notable flexibility to adapt service models to local markets (see our June feature). Africa is one of the few places in the world Uber is testing cash payments. Uber Africa is also experimenting with unique passenger location services, vehicle security features, and commercial delivery options for small businesses. In Kenya, Uber has logged over 1 million trips and claims 100,000 monthly app openings in Nairobi. For the time being, the biggest winner in the rivalry between ride-booking operators such as Little Cab and Uber could be Kenya’s citizens. Safaricom has a range of additional products, including tablets, mobile phones, its M-Kopa solar electricity kits, and digital TVs. Competition in African consumer based tech is bringing all kinds of new promos and product offerings around online retail, mobile devices, digital payments, and logistics services. And if Safaricom can demonstrate significant revenue by directly entering the online taxi market, expect Africa’s other big mobile operators to take notice. Rather than simply partnering with ride-booking apps on payments or mobile services, big telecoms firms such as MTN could simply acquire or create their own.